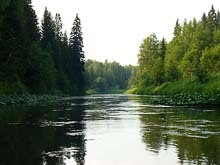 The river Sylva, the largest tributary of the river Chusovaya, received its name from the words in Komi language: "Syl" – “thawed” and "va" – “water”, i.e. thawed snow. 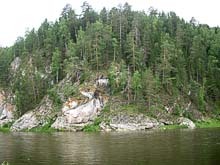 It flows from forested hills on the western slopes of the Urals. Rapid and rather deep in the beginning of summer, the river flows between picturesque banks, flanked by long steep cliffs, formed by sub horizontal layers of limestone deposits, schist and separate rocks. 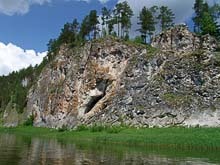 In rocky cliffs on the banks, it is possible to see remains of the ancient Perm sea - for example, corals, brachiopods and also fossils of ancient plants. Rafting begins near the village Tokhtarevo. Not far from here on the left bank the historical town Suksun is located. In 1729 the copper smelting and iron foundries were established here by Akinfij Demidov – from the famous dynasty of merchants of the 18th century and founders of the mining and metallurgical industry in the Urals. In these factories in the middle of the 18th century master Fedot Kiselev, made a copper “quart” (a measure of a liquid), which was used by M. Lomonosov as a still. This “quart - still” is kept in a historical museum in Moscow. In 1841 serf master, Timkin, built the first iron steamship in Russia for the transportation of copper and iron on the rivers. The same factories also produced the well-known Suksun samovars. In Suksun there is a museum of local history. After Suskun, the current becomes swift, and soon, near the village Sasykovo you can see on the right bank, the waterfall “Plakun” (“Weeping”). Two springs, streaming down from the mountain, flow together and form a stream, which, falling from height of 7 metres, is broken into a thousand sprays - the “tears” – thus the poetic name for the waterfall. After the mouth of the river Mazuevka begins “Black Yar” - a high steep bank, overgrown with fur-trees and pines. After the mouth of the river Taz, where the river Sylva turns to the south appears one of the most beautiful rocks on the river – “Kamien Lobach”. The upper part of “Kamien Lobach” reminds of ruins of a Middle Age castle on a high hill. South-west from the village Grebushino the river turns to the north, forming a bend which the inhabitants named “the Shovel”. On the right bank, where the bend ends, rise the rocks “the Bastions - named for similarity to “military strength”. In the rocks there are small caves. Further downstream are the beautiful rocks: “Kamien Mezhevoj” and “Kamien Ermak”. The “Kamien Ermak” consists of three peaks - the highest refers to "Ermak", lower is the massif “Ermachikha” and lower still – the small peak "Ermachenok". From top of this rock, enchanting views of the environment open before us. On the right bank before the city Kungur we find “Mt. Ledyanaya” (Ice mountain) - in which there is the famous Kungurskaya ice cave. Our rafting finishes in Kungur. There you will take a tour of the town, be part of an exciting excursion to the Kungurskaya ice cave, which will reveal to you its 20 fascinating grottos - the “Diamond” and the “Polar”, with their glittering snow crystals, the “Meteor”, reposing in pitch-darkness, the “Ethereal” with its all year round dripping and “organ-pipes” - well-like holes which water droplets formed in the rock mass. You will see magnificent underground lakes, amazing stalactites and stalagmites and so much more. Optimal time for the tour: June - August.